Most fight fans, of both disciplines, boxing and MMA, thought it was all a big joke and perhaps still do – but Tyrone Woodley, the reigning UFC welterweight champion, is taking Floyd Mayweather Junior’s possible venture into the Octagon very seriously. Speaking with TMZ, Woodley says he is training Mayweather, with the prospect of “Money” indeed having an MMA bout this year some time. 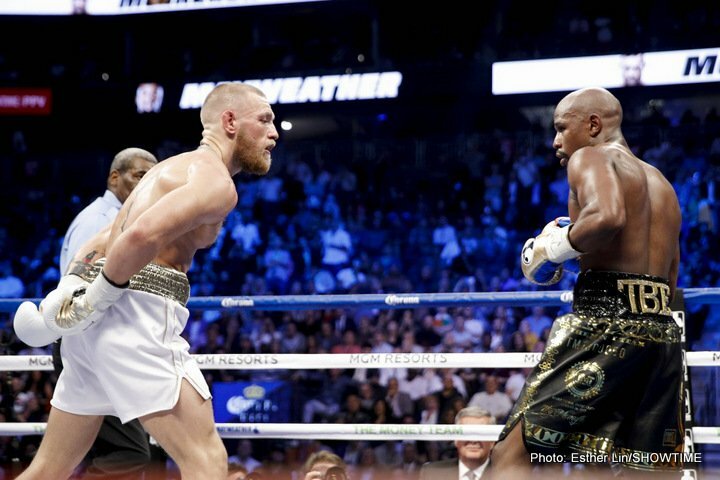 Just who Mayweather would face in his Octagon debut remains unknown, but we all know Conor McGregor feels he is owed a return fight with Mayweather, this time under UFC rules. Who knows if Floyd will actually go through with an MMA bout. It’s possible that, after a few days doing the training needed to have a shot at being successful in MMA, Mayweather will say forget it and not take the risk. Then again, with the vast amount of money that Floyd knows he would pull in should he fight in the Octagon (and let’s face it, we’d ALL tune in, simply to see what happened! ), maybe he will indeed engage in at least one MMA fight. Presumably Mayweather is paying Woodley for his services, and Mayweather has never been one to throw his money away (oh, okay, he used to, back when he was “making it rain”) so maybe he is indeed highly serious about swapping the ring for the Octagon. “I think I want to fight in the UFC,” Davis tweeted at the weekend. Will we get to see both the old master and the young contender make an appearance inside the cage this year?